Ashokan Dreams B&B - B&B Lodging, Weddings and Celebrations, Vaction Rental in the heart of the Catskills, near Woodstock, Kingston and Phoenicia. An historic converted Catskill Mountains barn with breathtaking mountain and reservoir views in a quiet country setting. Decorated in rustic comfort reminiscent of the Adirondack "Great Camps". We are close to Woodstock, Phoenicia, Kingston and High Falls, NY. 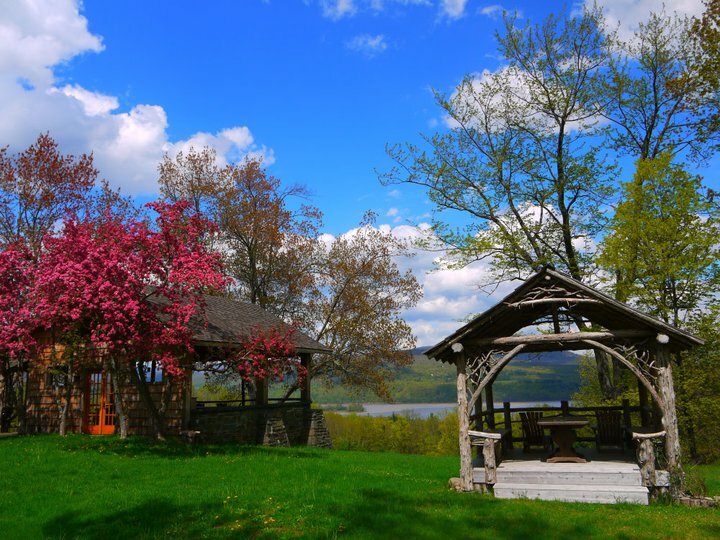 In the spirt of Catskill's boarding houses we invite you to be our guest and relax in your private suite with stunning views of the Catskill Mountains, Ashokan Reservoir and our gardens and gazebos. Venture out to hike or bike in the Catskill Preserve or experience the new Ashokan Resevoir Rail Trail or the Reservoir Promenade trail! Experience the local scene and breweries, distilleries, music, galleries and extraordinary farm-to-table dining. Sample local breakfast spots or enjoy a gourmet breakfast delivered to you in your private B&B suite. We feature homemade baked goods, local and organic foods and our house-made maple syrup! Three suites await you in our restored 1780's barn. Each with private entrance, stove or fireplace, A/C and wireless internet. We are here year round for your enjoyment. This unique and private home is situated on 30 acres perched on the shoulder of High Point Mountain in the Catskill Forest Preserve. There are stunning views of the Catskill Mountains, the Ashokan Reservoir and the Berskshire Mountains to our east. Rustic gazebos, stone patios, gardens, meadows, forest, streams and a pond, we have everything you need for a relaxing stay and a perfect wedding or celebration. A short distance from the arts, music and social activities of Woodstock, High Falls, Phoenicia and Kingston. We have everything needed to make this magnificent site and historic home the perfect location for your celebration. Many years ago our B&B guests started asking about having their weddings here and we have been having a limited number of events every year since 2007. Check our Schedule or...contact us! Come enjoy a weekend in the Catskill Mountains. Your hosts from Ashokan Dreams B&B and Catskill Mountain Angler will share their experiences with you to create an extraordinary fly fishing adventure in the heart of the Catskill Forest Preserve. Sample of a weekend of fly fishing in the Catskill Mountains with your hosts from Ashokan Dreams B&B and Catskill Mountain Angler﻿.